The Matadors dropped a late-inning heart-breaker 6-4 to the visiting No. 10 UCLA Bruins on Thursday in front of a packed home crowd at the Matador Diamond. Marking the last game before CSUN opens their stretch of Big West conference games, Northridge struggled to hold on to an early lead resulting in a 10th inning loss to the No. 10 ranked softball program in the nation. 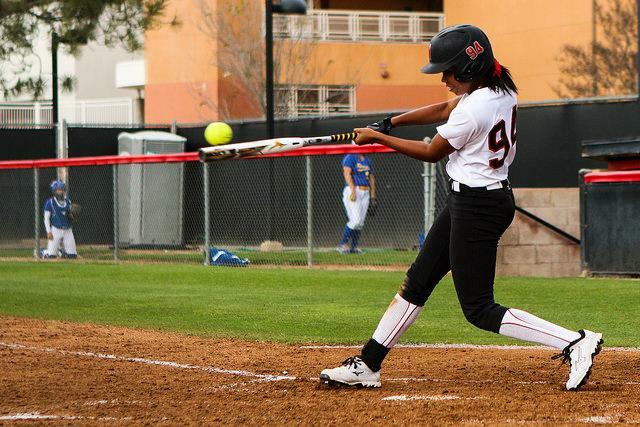 CSUN sent strikeout artist senior pitcher Brianna Elder to the hill to counter UCLA’s freshman pitcher Johanna Grauer. Both pitchers wouldn’t last long, with both making an exit from the mound within two innings of work. UCLA jumped on the board early in the first inning. Senior first baseman Stephany LaRosa tagged Elder for a big two run triple to score the first runs of the game. Northridge struck back in the bottom of the second. Junior utility Arianna Wassmer lifted a double through the middle infield to score freshman shortstop Savannah Horvath. Two at-bats later, sophomore Maylynn Mitchell slapped a double of her own to plate Wassmer and tie the game up at two. Two more Matador runs would cross the plate before the close of the inning courtesy of a passed ball and a wild pitch to give the Matadors the 4-2 lead. Both teams would make pitching changes to start the third inning. UCLA gave senior pitcher Ally Carda the call from the bullpen, while CSUN opted to let freshman pitcher Zoe Conley toss the rest of the game in lieu of Elder. The score would remain in CSUN’s favor for the next couple of innings, but UCLA would start chipping away at CSUN’s lead. LaRosa, UCLA’s number three batter, padded her stat sheet a bit by knocking a double into the outfield, picking up her third RBI of the game. Two innings later, UCLA tied the contest up when junior catcher Brittany Moeai cranked a RBI single, sending the game into extra frames. The deciding moments of the game came in the tenth inning. Carda helped her own cause by plating the go-ahead run on a single up the middle. Freshman catcher Maddy Jelenicki added an insurance run shortly after to push the Bruin’s lead to two. CSUN batters combined for just five hits in 10 innings at the dish. Conley pitched eight full innings of relief while striking out nine. UCLA seemed to have CSUN’s pitchers figured out, despite what the score might have suggested. UCLA tagged Matador’s pitchers for 13 hits while drawing five walks. Both teams combined for 21 total strikeouts (11 for UCLA, 10 for CSUN). The Matadors will take Friday off before kicking off the second half of the season against the Cal Poly Mustangs (17-17) this week. The Matadors and the Mustangs will engage in a three game series starting with a Saturday double header, before capping off the series on Sunday.